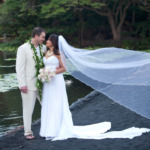 Hawaii wedding on the beach of the Four Seasons Resort Hualalai. The couple had lots of great details in their wedding. I loved the bride’s cloth and button bouquet and the groom’s cufflinks which were robots. 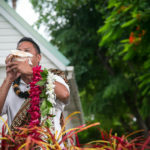 The wedding site had flower leis hanging from the trees, and flowers covering the beach. The reception site was filled with lots of big bare bulbs, which made for a great effect. The had a live band, great food, and great deserts. The folks at the Four Seasons know how to throw a wedding reception.